Afraid to love or trust anyone, a man learns the true meaning of forgiveness. Follow his compelling journey of faith, love, healing, and recovery as he reaches his dreams. A scientist named Griffin invents a way to change his body's refractive index and thus becomes invisible. He uses the opportunity to carry out random acts of violence. This must have been a wondrous new addition to 1950s Television? Made by ITC who had acquired 'Official Films' and who always managed to produce something a little different.. Its very easy to criticize this series in the 21st century, but if you look at it in the context of the time it was made, It was pretty darn clever. The special effects still look effective and It must have been difficult trying to make a show like this in television time and budget? 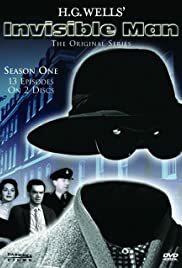 Certainly this show's effects stand up well against the 1975 'Invisible Man' remake series which used a lot of chroma key overlay for effects and consequently the large amount of blue fuzz, made that one unconvincing.